One of the most commonly remarked upon aspects of the new tax reform law is its unpopularity with the American population as a whole. Our research at Gallup shows that just about three in 10 Americans approved of the bill a couple of weeks before it was passed; over half disapproved. Combine that with a very unpopular Congress, and we have a situation in which an unpopular Congress is passing an unpopular bill -- which will be signed into law by an unpopular president. 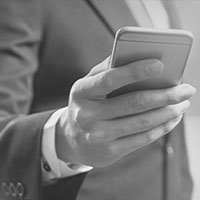 Those who passed the legislation and who are extolling its virtues believe it will ultimately be a landmark and positive change for the United States and its citizens. 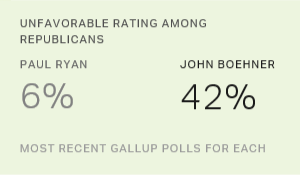 But how do the bill's supporters square this perception with its (and their) unpopularity? Mostly, they appear to believe its benefits will become more and more evident in the months and years ahead, and that members of the public will eventually thank Congress for the bill when they see positive results -- in particular, a reduction in their taxes. Much of the negative reporting on the public's take on the tax reform bill is based on national polling, all of which shows more unfavorable than favorable reactions to the legislation. So we can certainly say that one outcome we will monitor in 2018 is the degree to which Americans' approval of the bill in surveys changes as the year progresses. Republicans (and President Donald Trump), of course, would argue that the current approval levels will rise significantly. One thing we have seen consistently as we monitor polling results day in and day out at Gallup is the degree to which the public's views on a wide variety of issues are highly related to partisanship. Basically, at this juncture in history, Republicans are positive about a great deal of what we measure and Democrats are negative. On this bill, our polling shows that 70% of Republicans, 25% of independents and 7% of Democrats approve of the legislation. We found in tracking attitudes toward the Affordable Care Act, which showed the opposite partisan pattern, that changes mainly occurred among Democrats and independents. Republicans were constant in their disapprobation. 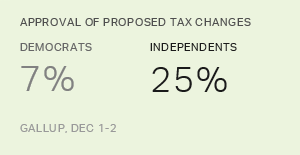 This suggests that if we are going to see an uptick in approval for the tax reform legislation, it's most likely going to be among Republicans and independents. The current rigid polarization in American attitudes suggests a fairly low probability that Democrats are going to end up saying they approve of the bill -- no matter what happens next year. A second outcome measure that could be affected by the tax reform legislation is projected voting for Republican candidates. This is a difficult one to measure because we don't know what is causing change even if we do see it. Right now, available "generic ballots" conducted by various research firms show the Democrats ahead, and pundits think that the usual headwinds for the party not in the White House in an off year, coupled with the dynamics of Trump and the GOP, will make it a tough year for Republican candidates. We can watch the generic ballots and, of course, wait for the final results next Nov. 6, the date of the midterm elections. But, as noted, if things do begin to look better for Republican candidates, the challenge will be in figuring out exactly what's behind it. A third measurable outcome will be attitudes toward Congress, Trump and the Republican Party. At this point, these are all in bad shape. Congressional job approval ratings have been consistently in the high teens over the past couple of years, and our new data show that the perceived honesty and ethics of members of Congress continues to be near the bottom of the list of all professions tested. Trump's approval ratings are the lowest for any newly elected president in his first year in Gallup's history. The Republican Party's favorable rating is at 36%, below the Democrats' and, of course, low on an absolute basis. In short, there is a lot of room for improvement on all three of these indices. I would expect that if the bill is going to engender increasingly positive attitudes on the part of the American public in the coming year, we will see it first in increasingly positive ratings for these three entities. Finally, Republican proponents of the new legislation may be looking at a much narrower outcome: how their base voters react to the bill, and perhaps also the reaction of financial contributors. We have no data on contributors, but we certainly do know that rank-and-file Republicans react positively to the bill, will vote for the Republican Party this coming November and are already positive toward Congress, Trump and the GOP. So the legislation's impact will presumably be to reinforce these existing attitudes. It's useful to review the environment in which this bill has been passed. About half of Americans think the amount they pay in taxes is too high, so that presumably means that half of the population will and half won't be particularly gratified by a tax cut. 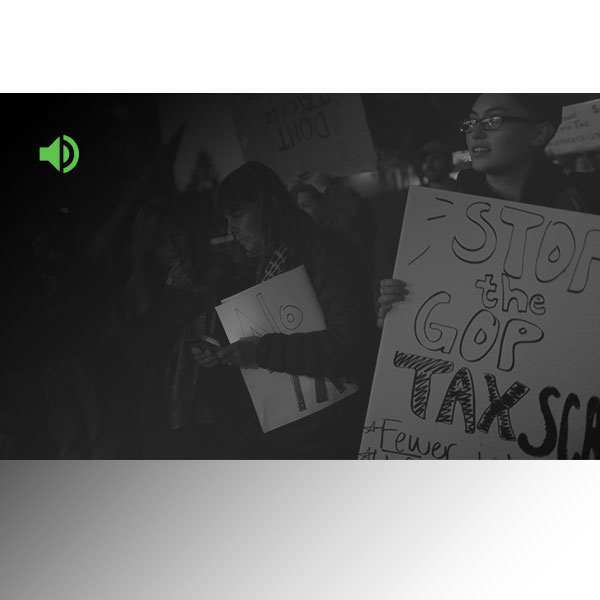 Americans have widely held beliefs that the amount paid in taxes by corporations is already too low, as is the case in their perceptions of the taxes paid by upper-income Americans, so the fact that the bill cuts taxes for these two groups creates perceptual problems for the bill's supporters. On the other hand, Americans last January rated Trump's promise to lower taxes for all Americans as one of the two most important ones that he should keep (the other was spending more to improve infrastructure). So that's a positive for the bill's proponents. The bill's supporters also argue that the bill will come to be seen positively because it will spur economic growth and thus create more jobs. At the moment, however, Americans are less worried about the economy and more positive about jobs than they have been in a long time. So the degree to which an accelerated economic boom next year, should it occur, will be perceived as a direct result of the Tax Cuts and Jobs Act remains to be seen. Should the GOP Care That Its Tax Bill Is Unpopular? 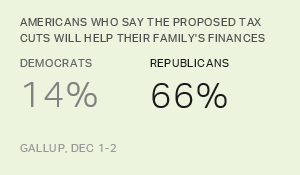 The GOP tax reform bill lacks bipartisan public support, with only 7% of Democrats and 25% of independents in favor, contrasted with 70% of Republicans. Republicans Like Paul Ryan, But Will They Turn on Him?